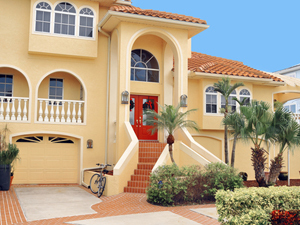 Get Your Multi-Carrier Florida Homeowner Insurance Quotes Here. Call 352-200-2066 to Speak to a Professional Homeowners Agent. Like many property owners, you might be overpaying for your Florida home owners insurance coverage. We will be offering tips on this page so that you can lower your premiums to save a good amount of money. RTC Insurance offers you a lot of carriers when you shop for Florida homeowner insurance quotes with us. We want to show you the entire market and we give you the greatest chance to lower your rate with 37 available homeowners insurance companies in Florida. It may have been a long time since you've shopped for a new Florida home owners insurance policy. This piece of information may be interesting for you to know. The way the market is configured, huge variances of premiums are offered company to company for similar policies. We make it easy for you to view rates here by emailing you a listing of all our carriers from low to high premium. Our companies are all A rated and a proposal will be sent to you after submitting your basic information through our form. If you choose to use our services, you might very well find a yearly savings between $460-$1250 with the Florida homeowner insurance quotes we provide you. Nearly every one of the homeowners insurance companies in Florida allow for a myriad of discounts that will reduce the cost of your plans premium. Just to let you know and for instance, by living in a secured community, most company's will offer you a premium discount. Just by being in one of these communities lowers the risk of burglary. This discount can amount for 2% - 5% off. By simply having a good credit score, some homeowners insurance companies in Florida will lower your rate for this too. With a higher credit rating, carriers consider you less of a risk of defaulting on your premium. This is good news because you get rewarded for paying your bills on time and having less debt than others. If you have a company, like ADT, monitoring your home for fire and burglary, you will be guaranteed a lower rate, simply because the chances of mitigating a loss will be increased. If you are now a retired person or over a certain age (60 in most cases), just about every insurance company will issue a discount to you. From their stand-point, they realize more time will be spent at home allowing you to react faster to an emergency and you will lower the chances of further damage. One can not just anticipate every company will give a discount. When you speak with one of our agents, we will tell you every discount the company offers for their Florida home owners insurance policy. A deductible is your direct out of pocket cost that needs to be paid by you before the carrier will respond. The larger the deductible that you select, the cheaper the premium will be. You may be asking, Why is this? The reason for this is that the insurance company realizes you won't be calling for every small loss you experience. Claims will be reduced and this lowers the overhead of the insurance company. Average savings between 12% and 20% are attainable by moving your deductible to $2,500 from a thousand dollars. Depending on your risk tolerance, a 30% savings might be possible if you increase your deductible to 5 thousand dollars. All homeowners insurance companies in Florida give a discount for a good wind mitigation inspection. Not all homes are eligible for discounts after getting a wind mitigation, but chances are good that you will see some savings. To request Florida homeowner insurance quotes from us today, please call us at 352-200-2066 or fill out the above form.